Artificial hair fibre implantation is one of the earliest methods of hair restoration. As hair restoration surgery became a widely practiced cosmetic procedure, many companies and hair restoration surgeons around the world experimented with different types of artificial fibers which could give the appearance of hair. Natural hair from other persons were also tried. However, artificial fiber very soon fell into disrepute. Hair from other persons gave rise to serious host vs graft reactions and were rejected by the scalp immediately. It was found that artificial fibers also gave rise to a similar reaction and were rejected by the scalp which ejected them leaving behind scars and granulomatous tissue. There were also severe infections leaving the patient worse off than before with a cosmetically scarred scalp. This led to the FDA banning artificial fibers for hair transplant in 1984 and artificial fibers are banned till today in the US and Canada. However, since then, there has been a lot of advance in the material of the fibers. While the early fibers used polyacrylic material, the present fibers use polyamide and this has a big advantage over the earlier ones in that it is much less allergenic. However the procedure of artificial fibre implant continues to have a number of problems as a result of which it has never become popular and its use is very restricted. There are two main fibres being used today around the world, Biofibre and Nido. Biofibre is made in Italy and it is the most widely used among artificial fibres. It is licensed in most European countries and many other countries around the world and has applied for FDA approval in the US though this approval has not yet been granted. Nido is used mainly in Japan. Both these fibres are available in India and there is no restriction in the use of artificial fibres in India. The fibres are available in varying lengths upto 15 cm and the patient can choose the length of hair he wants. There are also three different textures of straight, wavy and curly. Diameter is .08mm. The fibres are inserted by a special method with a knot into the galea, the layer just above the bone of the head. Patients do not have to undergo the process of donation and so the procedure is shorter than that of a normal transplant. The fibres of course do not grow in length. Patients can wash and comb their hair but need to be extra careful while doing these activities. Despite technological advances in materials, artificial fibres have very limited acceptability throughout the world and this is due to the limitations inherent in the technique. Temporary: This is the main disadvantage of artificial fibres. The immediate allergic reactions which led to early rejection of the fibres has now been mostly eliminated and only about 1% of people suffer allergic reactions. But the fibres continue to have foreign body reactions and are gradually expelled by the body. About 30-50% of fibres are ejected in a year after the transplant. This means that by 2 years most people need a repeat transplant. This is the main drawback of the procedure. 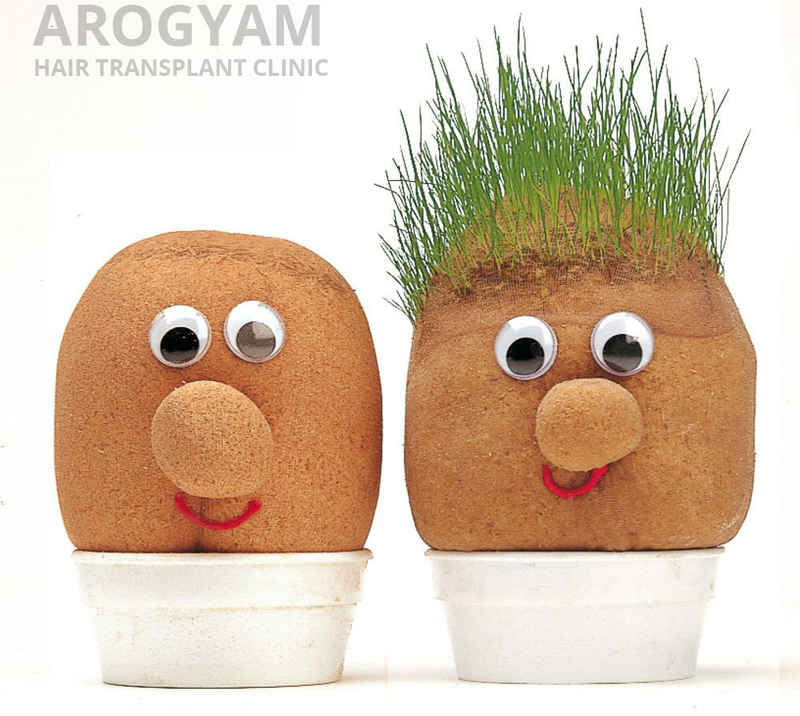 As artificial fibres are somewhat more expensive than normal hair transplant, this means that the patient has to spend much more if he opts for artificial fibre, besides the hassles of repeated procedures. Granulomatous reactions: The fibres continue to evoke a foreign body reaction and this leads to granulomatous tissue formation around the follicles. This leads very commonly to infections and causes folliculitis. Sometimes it can lead to severe infections. Patients have to return to the clinic every month to have their scalp cleaned. The biggest disadvantage from granulomatous reactions is that this can lead to scarring of the scalp which makes it unsightly. Even if the patient is ready to do repeated transplants the scalp condition itself does not permit it after a couple of procedures. Also the scalp becomes unsuitable for normal hair transplant after artificial hairs have been implanted two or three times. Besides these two main drawbacks of artificial fibres, there are several other disadvantages of this technique. Regular follow-up: regular follow-up is required at the doctor’s to maintain the fibres. Usually monthly checkups are required. This is necessary to keep the scalp clean, remove any granulations, remove any loose fibres, etc. Without regular checkups longevity of the fibres will be greatly reduced. Extra care: the patient has to be very careful in maintaining his hair. Extra care is required in combing, washing and drying hair as the fibres might fall with vigorous maneuvers. Inability of styling: The patient has to keep the same style of hair chosen initially. The hair cannot be dyed or waved. Patient also cannot shave his head. Differences in color, texture and waviness: though many variations are available in color, it is very difficult to get the exact match of color, waviness and texture combined. Hence the artificial fibres are always somewhat different. Lack of growth: Since the fibres do not grow in length, this poses difficulties as the rest of the hair will grow and the patient has to be extra careful while getting a hair cut to ensure the barber does not cut the artificial hair. Breaking of fibre: the fibres can also break off leaving behind the root in the scalp and this can cause irritation and granulomatous reactions for a long time as these short roots do not come out easily. Because of all these attendant disadvantages and hassles, artificial fibre implant has never become popular. It is not in common use and only a few clinics do it throughout the world. In India, it is available in a clinic in Pune but may be available in some other centers also. Artificial Fibre Implant does have a specific role and this is in cases of severe balding with insufficient donor area. It is also the only procedure possible in complete alopecia. It may also be considered by patients who desire a very luxuriant crop of hair beyond the limits of their donor area. In all other cases, hair transplant with patient's own hair is undeniably the procedure of choice.